Yes, things turned out all right for the guy. But there was a bust and at least one close call. I colored the results and I highlighted the terrible parts in bold, for those who can’t look past the green spaces. 1920 was the first horrible year. He lost more than everything, ending at £80,000 in the hole (roughly £900,000 in total losses, and not counting the “moral debts” he owed of another roughly £300,000 in today’s terms). Luckily friends and family lent him more than enough money, kept him in the game, and eventually would pay it all back. 1925 was the next big hit, a 32% loss. 1928 would cut his assets by more than half (70% loss). 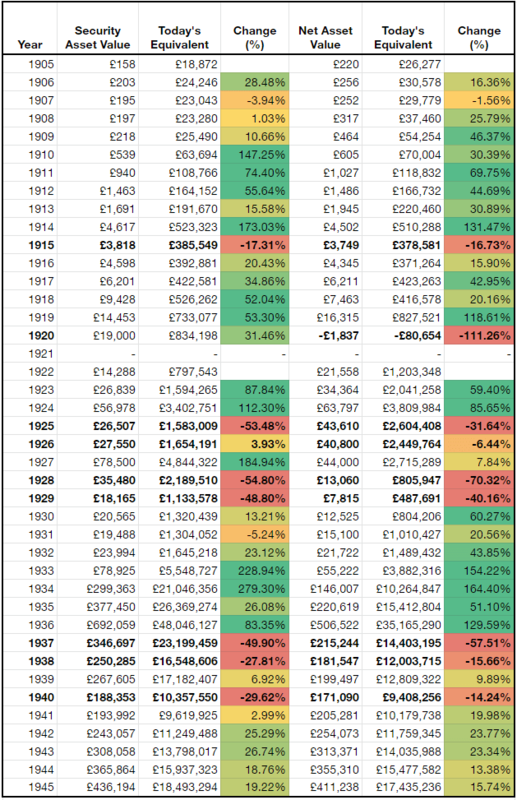 1929 would cut it almost in half again (40% loss). How many investors would be left in the fetal position after that five-year run? To see your net worth go from £3.8 million to £487,000 is hard to imagine. Then nearly a decade later another terrible multi-year run would strike again. You have to gives Keynes credit. The guy had guts. Most people would give up after the first crushing blow, and if they survived that the second would finish them. Not Keynes. He was obviously comfortable with all of it. He had the stubborn optimism and conviction needed to survive in his style. At the same time, his strategy reeks of a need to chase huge wins and get rich quick. He got lucky when friends and family helped bail him out after 1920. How much more luck, hidden in his numbers, might have saved him from a much worse fate? What would his end result look like had he avoided margin altogether? His results with the Chest Fund might offer a clue. While not being an apples-to-apples comparison, it should give you an idea of the possibilities. 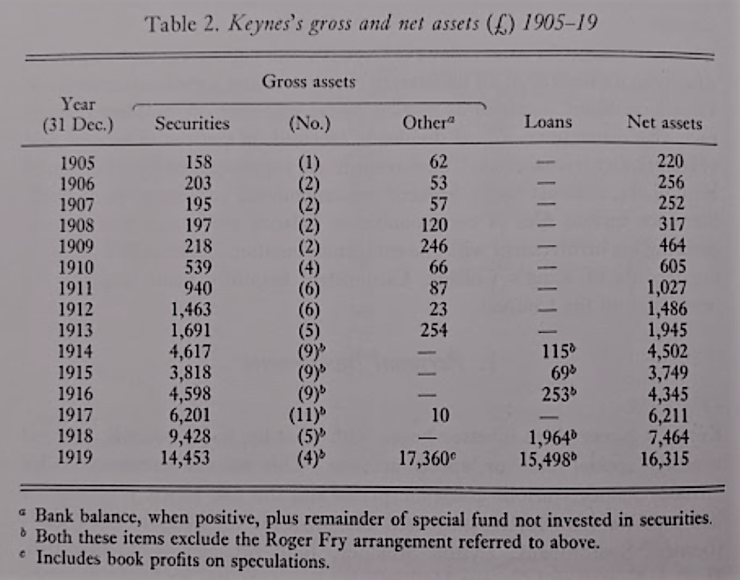 Keynes relied on margin, currencies, and commodities in his own account but no margin, and minimal currency and commodity speculation in the Chest Fund. The only similarity is the concentration in the portfolio. His best year never went above 56%. So it’s a much smoother result, for that period at least and compared to the big swings in his personal account. Looking at his change in net assets as a return (not the best way to do it), would get an extremely lumpy 13.7% annually over the 23 years shown. Given a choice between those two, my biased take is few people would be upset about a 10.2% return, given the circumstances. Would an extra 3%, with the additional risks, really be worth it? Markets, in the short term, can be very unpredictable. Unexpected events pop up often enough that the potential upside earned on margin is outweighed by the possibility of going broke on it. 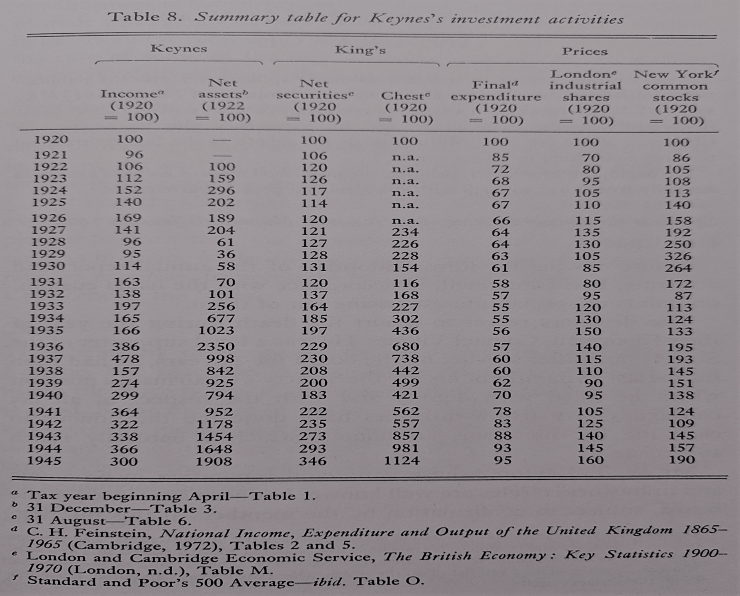 Looking at Keynes’s forty-year personal experience, I see risk management pushed aside for a focus on returns at all cost. 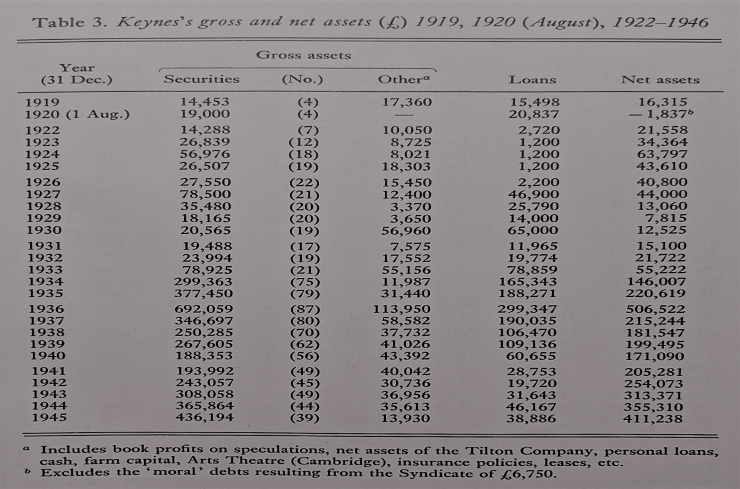 A cost Keynes was lucky to not suffer twice. The Chest Fund seems to attempt to do the opposite, with great results, and with much less risk of going bust.